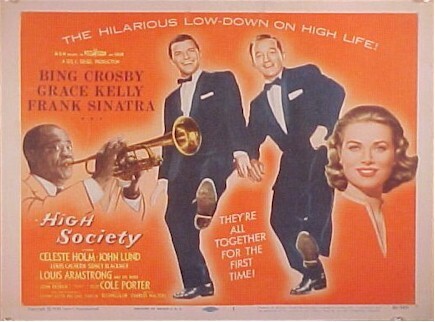 1956 - "High Society". Title Card (11x14"). Absolutely stunning Title Card. Just look at the graphics and artwork. What else needs to be said!!?? Sinatra-Crosby-Kelly-Armstrong. Looks even nicer, sharper in-person!! 1956 - Nice Original lobby card (11x14") with Frank and Bing. 1956 - Original, RARE insert (14x30") for this unforgettable classic. The artwork on these FOUR great stars is stunning!! Excellent condition.